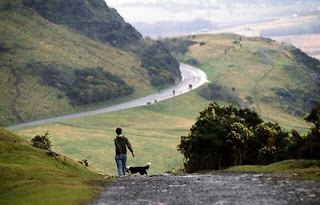 Holyrood Park is a park in Edinburgh, Scotland. What's so special about this place is that this park is situated at central Edinburgh itself! It's easily accessible from the town, yet provides a landscape that one would expect it's in the Scottish Highlands! 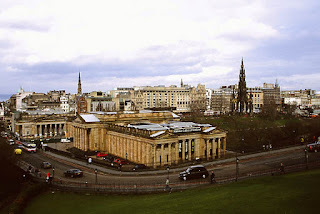 In the park itself, there are numerous hills and there is a series of cliffs known as Salisbury Crags. Running through all these, there are walking trails and routes that is very popular with locals and foreigners alike. I enjoyed the walk alot, although on that particular day, there were alot of walkers as it was a beautiful dry day after a series of cold wet days! 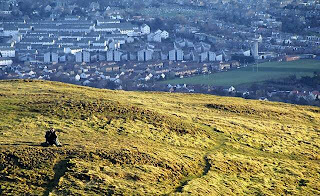 At the centre of the park, lies the main peak of the hills, known as Arthur's Seat. Here, being the highest point of Edinburgh city, it provides wonderful views of the city and beyond. 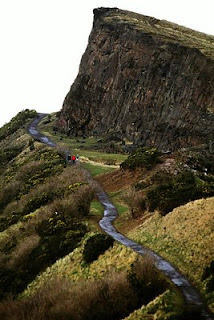 The walk up is relatively easy, and so, needless to say, it is a not-to-be-missed activity when you next visit Edinburgh! There is also a lake at the foothills, filled with some beautiful swans. There is also Holyrood Palace nearby, as well as a chapel. The Palace started out as a monastery, but eventually served as the residence of the Kings and Queens of Scotland. But for me, the highlight is the walk in the park!